Zoe Karbonopsina, also Karvounopsina or Carbonopsina, i.e., "with the Coal-Black Eyes" (Greek: Ζωή Καρβωνοψίνα, Zōē Karbōnopsina), was an empress consort and regent of the Byzantine empire. She was the fourth spouse of the Byzantine Emperor Leo VI the Wise and the mother of Constantine VII, serving as his regent from 914 until 919. Zoe Karbonopsina was a relative of the chronicler Theophanes the Confessor and a niece of the admiral Himerios. Desperate to sire a son, Leo VI married his mistress Zoe on 9 January 906, only after she had given birth to the future Constantine VII at the end of 905. However, this constituted his fourth marriage and was therefore un-canonical in the eyes of the Eastern Orthodox Church, which had already been reluctant to accept his third marriage to Eudokia Baïana, who died in childbirth in 901. Although the Patriarch Nicholas Mystikos reluctantly baptized Constantine, he forbade the emperor from marrying for the fourth time. Leo VI married Zoe with the assistance of a cooperative priest, Thomas, but Nicholas' continued opposition to the marriage led to his removal from office and replacement by Euthymios in 907. The new patriarch attempted a compromise by defrocking the offending priest but recognizing the marriage. When Leo died in 912, he was succeeded by his younger brother Alexander, who recalled Nicholas Mystikos and expelled Zoe from the palace. Shortly before his death, Alexander provoked a war with Bulgaria. She returned upon Alexander's death in 913, but Nicholas forced her to enter the convent of St. Euphemia in Constantinople after obtaining the promise of the senate and the clergy not to accept her as empress. However, Nicholas' unpopular concessions to the Bulgarians later in the same year weakened his position and in 914 Zoe was able to overthrow Nicholas and replace him as regent. 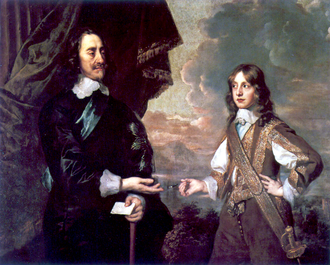 Nicholas was allowed to remain patriarch after reluctantly recognizing her as empress. Zoe governed with the support of imperial bureaucrats and the influential general Leo Phokas the Elder, who was her favorite. Zoe's first order of business was to revoke the concessions to Simeon I of Bulgaria, including the recognition of his imperial title and the arranged marriage between his daughter and Constantine VII. 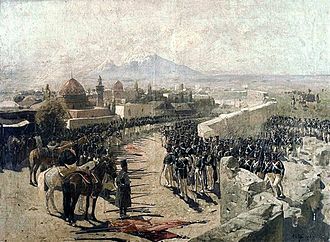 This renewed the war with Bulgaria, which began badly for the Byzantines who were distracted by military operations in Southern Italy and on the eastern frontier. In 915 Zoe's troops defeated an Arab invasion of Armenia, and made peace with the Arabs. This freed her hands to organize a major expedition against the Bulgarians, who had raided deep into Byzantine Thrace and captured Adrianople. The campaign was planned on a grand scale and intended the bribing and transportation of Pechenegs into Bulgaria by the imperial fleet from the north. However, the Pecheneg alliance failed, and Leo Phokas was crushingly defeated in the Battle of Anchialus and again at Katasyrtai in 917. Zoe tried to ally with Serbia and the Magyars against Simeon. This also failed to produce any concrete results, and the Arabs, encouraged by the empire's weakness, renewed their raids. A humiliating treaty with the Arabs of Sicily, who were asked to help subdue revolts in Italy, did little to improve the position of Zoe and her supporters. In 919, there was a coup involving various factions, but the opposition to Zoe and Leo Phokas prevailed; in the end the admiral Romanos Lekapenos took power, married his daughter Helena Lekapene to Constantine VII, and forced Zoe back into the convent of Saint Euphemia. ^ J. Gordon Melton. 2014. Faiths Across Time: 5,000 Years of Religious History [4 Volumes]: 5,000 Years of Religious History. Page 628. ^ Marina Belozerskaya (2012). Medusa's Gaze: The Extraordinary Journey of the Tazza Farnese. P. 53. ^ John Carr (2015). Fighting Emperors of Byzantium. Pen and Sword. "Zoe Karbonopsina was brought back from her cloister and appointed chief regent for her son.” P. 146. Wikimedia Commons has media related to Zoe Karvounopsina. 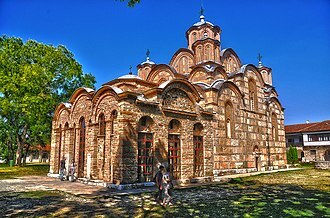 Тhe medieval history of Serbia begins in the 6th century with the Slavic invasion of the Balkans, and lasts until the Ottoman occupation of 1540. 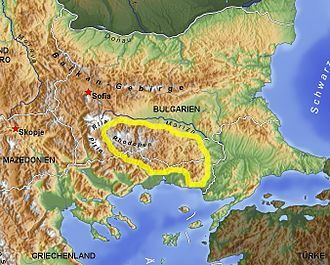 Sclaveni raided and settled the western Balkans in the 6th and 7th century, through linguistical studies, it is concluded that the Early South Slavs were made up of a western and eastern branch, of parallel streams, roughly divided in the Timok–Osogovo–Šar line. The DAI drew information on the Serbs from, among others, the first capital was Ras, in Raška. The other Serb-inhabited lands that were mentioned included the countries of Paganija and Travunija and these polities bordered Serbia to the north. 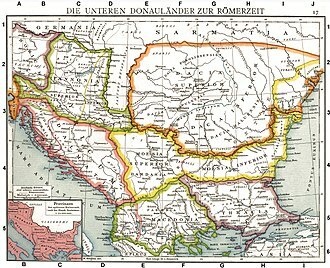 The exact borders of the early Serbian state are unclear, the Serbian ruler was titled Prince of the Serbs. The DAI mentions that the Serbian throne is inherited by the son, i. e. the first-born, his descendants succeeded him, between 1043 and 1080, under Mihailo Vojislavljević, and his son, Constantine Bodin, Duklja saw its apogee. Mihailo was given the nominal title King of Slavs by the Pope after having left the Byzantine camp and supported a Slavic uprising in the Balkans, in which his son Bodin played a central part. Having incorporated the Serbian hinterland and installed vassal rulers there, this maritime principality emerged as the most powerful Serb polity, between 1113 and 1149 Duklja was the centre of Serbian–Byzantine conflict, with members of the Vojislavljević as protégés of either fighting each other for power. The Serbian Grand Principality, known as Rascia, was founded in 1090, when Bodin had died, Rascia became the strongest entity, in which the Serbian realm would be seated, in hands of the Vukanović dynasty. Uroš I, the son of Vukan, ruled Serbia when the Byzantines invaded Duklja, and Rascia would be next in line, Uroš II initially fought the Byzantines, but after a defeat soon gives oaths of servitude to the Emperor. Desa, the brother of Uroš II and an initial Byzantine ally, turned to Hungarian support, but was deposed in 1163, Stefan Nemanja was succeeded by his middle son Stefan, while his first-born son Vukan was given the rule of the Zeta region. 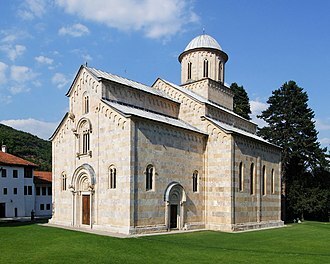 Stefan Nemanjas youngest son Rastko became a monk, turning all his efforts to spread religion among his people, since the Catholic Church already had ambitions to spread its influence to the Balkans as well, Stefan took advantage and obtained the royal crown from the Pope in 1217. The Pechenegs or Patzinaks were a semi-nomadic Turkic people of the Central Asian steppes speaking the Pecheneg language which belonged to the Oghuz branch of Turkic language family. Three of the clans of the Pechenegs were the Kankalis/Kangli. The Pechenegs ethnonym derived from the Old Turkic word for brother-in-law”, sources written in different languages used similar denominations when referring to the confederation of the Pecheneg tribes. The modern Tatar name for them is Böcänäklär, Anna Komnene and other Byzantine authors referred to the Pechenegs as Patzinakoi or Patzinakitai. In medieval Latin texts, the Pechenegs were referred to as Pizenaci, East Slavic peoples use the terms Pečenegi or Pečenezi, while the Poles mentions them as Pieczyngowie or Piecinigi. The Hungarian word for Pecheneg is besenyő, the Romanian word for Pechenegs is Pecenegi According to Constantine VII Porphyrogenitus, three of the eight Pechenegs provinces or clans were known under the name Kangar. He added that they received this denomination because they are more valiant and noble than the rest of the people, however, no Turkic word with the meaning suggested by the emperor has been demonstrated. Ármin Vámbéry connected the Kangar denomination to the Kirghiz words kangir and kani-kara, Omeljan Pritsak proposed that the name had initially been a composite term deriving from the Tocharian word for stone and the Iranian ethnonym As. If the latter assumption is valid, the ethnonym of the three Kangar tribes suggest that Iranian elements contributed to the formation of the Pecheneg people. Mahmud al-Kashgari, an 11th-century man of letters specialized in Turkic dialects argued that the language spoken by the Pechenegs was a variant of the Cuman and he suggested that foreign influences on the Pechenegs gave rise to phonetical differences between their tongue and the idiom spoken by other Turkic peoples. Anna Komnene likewise stated that the Pechenegs and the Cumans shared a common language, although the Pecheneg language itself died out centuries ago, the names of the Pecheneg provinces recorded by Constantine Porphyrogenitus prove that the Pechenegs spoke a Turkic language. The Huns and Pechenegs are thought to have belonged to the same group of languages as the modern Chuvash language. Nicholas I Mystikos or Nicholas I Mysticus was the Ecumenical Patriarch of Constantinople from March 901 to February 907 and from May 912 to his death in 925. His feast day in the Orthodox Church is May 16, Nicholas was born in the Italian Peninsula and had become a friend of the Patriarch Photios. He fell into disfavor after Photios dismissal in 886 and retired to a monastery, Emperor Leo VI the Wise retrieved him from the monastery and made him mystikos, a dignity designating either the imperial secretary or a judicial official. On March 1,901, Nicholas was appointed patriarch, however, he fell out with Leo VI over the latters fourth marriage to his mistress Zoe Karbonopsina. He was deposed as patriarch on February 1,907 and replaced by Euthymios, exiled to his own monastery, Nicholas regarded his deposition as unjustified and involved Pope Sergius III in the dispute. About the time of the accession of Leo VIs brother Alexander to the throne in May 912, a protracted struggle with the supporters of Euthymios followed, which did not end until the new Emperor Romanos I Lekapenos promulgated the Tomos of Union in 920. In the meantime Alexander had died in 913 after provoking a war with Bulgaria, Nicholas Mystikos became the leading member of the seven-man regency for the young emperor, and as such had to face the advance of Simeon I of Bulgaria on Constantinople. This unpopular concession undermined his position, and by March 914, with the support of the magistros John Eladas, Zoe Karbonopsina overthrew Nicholas and she revoked the agreement with Simeon, prompting the renewal of hostilities with Bulgaria. With her main supporter Leo Phokas crushingly defeated by the Bulgarians at the Battle of Acheloos in 917, the Patriarch Nicholas came to be one of the strongest supporters of the new emperor, and took the brunt of renewed negotiations with the Bulgarians until his death in 925. 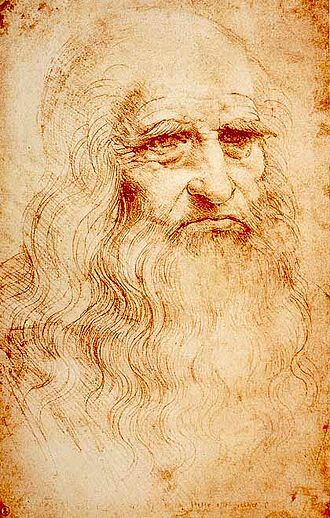 In addition to his numerous letters to various notables and foreign rulers and he was a critical thinker who went as far as to question the authority of Old Testament quotations and the notion that the emperors command was unwritten law. Edirne served as the third capital city of the Ottoman Empire from 1363 to 1453, before Constantinople became the empires fourth and final capital. At present, Edirne is the capital of Edirne Province in Turkish Thrace, the citys estimated population in 2014 was 165,979. The city was founded as Hadrianopolis, named for the Roman Emperor Hadrian and this name is still used in the Modern Greek. The name Adrianople was used in English, until the Turkish adoption of Latin alphabet in 1928 made Edirne the internationally recognized name. The Turkish, Bulgarian, Одрин, Edrêne, Slovene, Одрин and Serbian, Једрене / Jedrene are adapted forms of the name Hadrianopolis or of its Turkish version, see its other names. The area around Edirne has been the site of no fewer than 16 major battles or sieges, military historian John Keegan identifies it as the most contested spot on the globe and attributes this to its geographical location. According to Greek mythology, son of king Agamemnon, built this city as Orestias, at the confluence of the Tonsus and the Ardiscus with the Hebrus. The city was founded eponymously by the Roman Emperor Hadrian on the site of a previous Thracian settlement known as Uskadama, Uskodama or Uscudama and it was the capital of the Bessi, or of the Odrysians. Hadrian developed it, adorned it with monuments, changed its name to Hadrianopolis after himself, licinius was defeated there by Constantine I in 323, and Emperor Valens was killed by the Goths in 378 during the Battle of Adrianople. In 813, the city was seized by Khan Krum of Bulgaria who moved its inhabitants to the Bulgarian lands towards the north of the Danube. During the existence of the Latin Empire of Constantinople, the Crusaders were decisively defeated by the Bulgarian Emperor Kaloyan in the Battle of Adrianople. 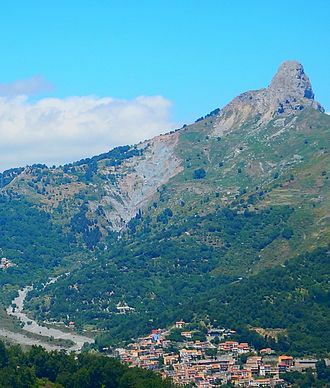 Later Theodore Komnenos, Despot of Epirus, took possession of it in 1227, in 1369, the city was conquered by the Ottoman sultan Murad I. The city remained the Ottoman capital for 90 years until 1453, Edirne is famed for its many mosques, domes and palaces from the Ottoman period. Saint Euphemia, well-spoken, known as the All-praised in the Orthodox Church, is a Christian saint, who was martyred for her faith in 303 AD. According to Christian tradition, this occurred at Chalcedon, according to tradition, Euphemia was arrested for refusing to offer sacrifices to Ares. After suffering various tortures, she died in the arena at Chalcedon from wounds sustained from a bear and her tomb became a site of pilgrimages. She is commemorated on September 16, Euphemias name and year of death are recorded in the 5th century Martyrologium Hieronymianum, the earliest extant list of Christian martyrs. The year,303, was the first year of the Great Persecution under Roman emperor Diocletian, the Fasti vindobonenses, a collection of liturgical documents from the 4th to 6th centuries, says she died on the 16th of October. Other than this, there is no historical information about Euphemia. Egeria, who made a pilgrimage to the Holy Land about 381-384 and wrote an account of her travels, Euphemia became a famous saint and stories about her accumulated, the Golden Legend, a collection of hagiographies from about 1260, includes an account of her martyrdom. St. Euphemia lived on the cusp of the 3rd and 4th centuries AD, according to tradition, she was the daughter of a senator named Philophronos and his wife Theodosia in Chalcedon, located across the Bosporus from the city of Byzantium. From her youth she was consecrated to virginity, according to Christian legend, the governor of Chalcedon, had made a decree that all of the inhabitants of the city take part in sacrifices to the deity Ares. Euphemia was discovered with forty-nine other Christians hiding in a house and worshipping their God, because of their refusal to sacrifice, they were tortured for a number of days, and handed over to the Emperor for further torture. Euphemia, the youngest among them, was separated from her companions and subjected to particularly harsh torments, including the wheel and she was placed in the arena where lions were sent out to kill her but they refused, instead just licked her wounds. It is believed that she died of wounds from a bear in the arena. Eventually, a cathedral was built in Chalcedon over her reputed grave, the Council of Chalcedon, the Fourth Ecumenical Council of the Christian Church, took place in the city of Chalcedon in the year 451. Leo Phokas was an early 10th-century Byzantine general of the noble Phokas clan. As Domestic of the Schools, the Byzantine armys commander-in-chief, he led a campaign against the Bulgarians in 917. After Lekapenos seized control of the Byzantine Empire, Leo led an unsuccessful revolt, Leo was the son of Nikephoros Phokas the Elder, an eminent Byzantine general who had distinguished himself in southern Italy. His brother, was a general, as were Bardass sons Nikephoros. Nikephoros eventually became Emperor in 963–969, little is known about Leos early life. During the late reign of Emperor Leo VI the Wise, he married the sister of Constantine Barbaros, the Emperors powerful parakoimomenos, although personally brave and not without some measure of success against the Arabs in the East, his ability as a general was rather limited. Steven Runciman attributed his rise more to his origin and his familial connection with the parakoimomenos Constantine. During the regency of Empress Zoe in 913–919, Leo is recorded as being again Domestic of the Schools, in 917, he was placed in charge of a large-scale expedition against the Bulgarians. Left unsupported by both the Pechenegs and the fleet, Phokas suffered a defeat at the hands of Tsar Symeon at the Battle of Acheloos. The imperial army was almost annihilated, and Phokas himself barely escaped, according to Runciman, Zoe herself may have planned to marry the general and solidify her own position. The parakoimomenos Constantine tried to neutralize this threat by disbanding the fleet, with this stroke, Zoe lost all control of the situation, and at Theodores urging, the young Emperor appointed the Patriarch Nicholas Mystikos as regent. The Patriarchs first act was to dismiss Leo Phokas from his post as Domestic, Leo apparently believed that Lekapenos, in view of his lowly origins, could never possibly put forward a credible claim for the imperial throne. A few weeks later, he married his daughter Helena to the young Emperor and assumed the title of basileopator, Leo Phokas was sent a letter, in the Emperors name, in which he was bidden not to react to these events. Eventually, Leo was forced to flee, but was captured and blinded by the Emperors agents in Bithynia. Helena Lekapene was the Empress consort of Constantine VII. She was a daughter of Romanos I and his wife Theodora, the deaths of Emperor Leo VI the Wise in 912 and his brother and successor Alexander in 913, left the throne of the Byzantine Empire to Constantine VII. Constantine was only seven years old when he assumed the throne, the Empire was placed in the care of regents. Nicholas Mystikos, Patriarch of Constantinople was the regent until March 914. He was displaced by Zoe Karbonopsina, mother of the young emperor, Zoe reigned with the support of influential general Leo Phocas until 919. However, Leo led the Byzantine army into a series of lost battles against Simeon I of Bulgaria in one campaign of the Byzantine-Bulgarian Wars and this strengthened the opposition to the Regent and her favorite general. 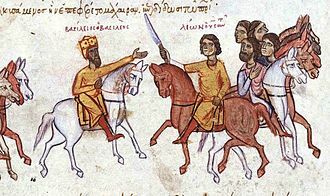 In 919, a coup détat involving various factions managed to remove Zoe from power, the new effective regent was Romanos Lekapenos, Drungarios of the Byzantine navy. Romanos orchestrated the marriage of Helena to Constantine VII as a way to secure a connection to the legitimate Macedonian dynasty, the work Theophanes Continuatus was a continuation of the chronicle of Theophanes the Confessor by other writers, active during the reign of her husband. The description of her marriage at the places the event in April or May 919. The groom was still four or five short of his fourteenth birthday. The age of Helena is not recorded but she was of minor age. They would not have children until the 930s, Romanos was proclaimed basileopatōr on the occasion of the marriage. In September,920, Romanos was invested as kaisar, on 17 December 920, Romanos was crowned co-emperor and in effect became the senior of the two associate emperors. Helena was now married to the junior co-ruler and her mother Theodora was crowned Augusta in January 921 and was her senior in palace hierarchy until her death on 20 February 922. Helena became in effect the senior co-empress of the following the death of her mother. Her brother Christopher Lekapenos became co-emperor in 921, prior to his elevation to the throne, Christopher was married to Sophia, daughter of magistros Niketas. Sophia was crowned empress in February 922, in 924, there was a senior Emperor, two junior emperors and two Empresses. Constantine VII Porphyrogennetos or Porphyrogenitus, the Purple-born, was the fourth Emperor of the Macedonian dynasty of the Byzantine Empire, reigning from 913 to 959. He was the son of the emperor Leo VI and his wife, Zoe Karbonopsina, and the nephew of his predecessor. Constantine VII is best known for his four books, De Administrando Imperio, De Ceremoniis, De Thematibus and his nickname alludes to the Purple Room of the imperial palace, decorated with porphyry, where legitimate children of reigning emperors were normally born. Constantine was born in this room, although his mother Zoe had not been married to Leo at that time, the epithet allowed him to underline his position as the legitimized son, as opposed to all others who claimed the throne during his lifetime. Sons born to a reigning Emperor held precedence in the Eastern Roman line of succession over elder sons not born in the purple, Constantine was born at Constantinople, an illegitimate son born before an uncanonical fourth marriage. To help legitimize him, his mother gave birth to him in the Purple Room of the palace, hence his nickname Porphyrogennetos. He was symbolically elevated to the throne as a child by his father. 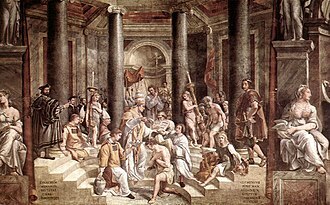 In June 913, as his uncle Alexander lay dying, he appointed a regency council for Constantine. Following Alexanders death, the new and shaky regime survived the attempted usurpation of Constantine Doukas, Patriarch Nicholas was presently forced to make peace with Tsar Simeon of Bulgaria, whom he reluctantly recognized as Bulgarian emperor. 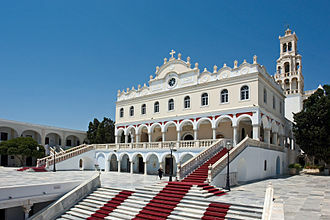 Because of this concession, Patriarch Nicholas was driven out of the regency by Constantines mother Zoe. She was no more successful with the Bulgarians, who defeated her main supporter, in 919 she was replaced as regent by the admiral Romanos Lekapenos, who married his daughter Helena Lekapene to Constantine. Romanos used his position to advance to the ranks of basileopatōr in May 919, to kaisar in September 920, just short of reaching nominal majority, Constantine was eclipsed by a senior emperor. Romanos Lekapenos, born in Lakape between Melitene and Samosata, was the son of an Armenian peasant with the remarkable name of Theophylact the Unbearable. Theophylact, as a soldier, had rescued the Emperor Basil I from the enemy in battle at Tephrike and had been rewarded by a place in the Imperial Guard. Although he did not receive any refined education, Romanos advanced through the ranks of the army during the reign of Emperor Leo VI the Wise, in 911 he was general of the naval theme of Samos and served as admiral of the fleet. In this capacity he was supposed to participate in the Byzantine operations against Bulgaria on the Danube in 917, on 25 March 919, at the head of his fleet, Lekapenos seized the Boukoleon Palace and the reins of government. It is notable that, as he left Constantine untouched, he was called the gentle usurper and his early reign saw several conspiracies to topple him, which led to the successive dismissal of his first paradynasteuontes, John the Rhaiktor and John Mystikos. From 925 and until the end of his reign, the post was occupied by the chamberlain Theophanes, the first major challenge faced by the new emperor was the war with Bulgaria, which had been re-ignited by the regency of Zoe. Consequently, the first four years of Romanos reign were spent in warfare against Bulgaria, although Simeon generally had the upper hand, he was unable to gain a decisive advantage because of the impregnability of Constantinoples walls. In 924, when Simeon had once again blockaded the capital by land, meeting Simeon in person at Kosmidion, Romanos criticized Simeons disregard for tradition and Orthodox Christian brotherhood and supposedly shamed him into coming to terms and lifting the siege. In reality, this was accomplished by Romanos tacit recognition of Simeon as emperor of Bulgaria, relations were subsequently marred by continued wrangling over titles, but peace had been effectively established. On the death of Simeon in May 927, Bulgarias new emperor, Peter I, made a show of force by invading Byzantine Thrace, in September 927 Peter arrived before Constantinople and married Maria, the daughter of his eldest son and co-emperor Christopher, and thus Romanos granddaughter. From this point on, Romanos government was free from direct confrontation with Bulgaria. Romanos appointed the brilliant general John Kourkouas commander of the armies in the East. John Kourkouas subdued a rebellion in the theme of Chaldia and intervened in Armenia in 924, from 926 Kourkouas campaigned across the eastern frontier against the Abbasids and their vassals, and won an important victory at Melitene in 934. The capture of this city is considered the first major Byzantine territorial recovery from the Muslims. In 941, while most of the army under Kourkouas was absent in the East, the invaders were defeated at sea, through the use of Greek fire, and again at land, when they landed in Bithynia, by the returning army under Kourkouas. In 944 Romanos concluded a treaty with Prince Igor of Kiev and this crisis having passed, Kourkouas was free to return to the eastern frontier. 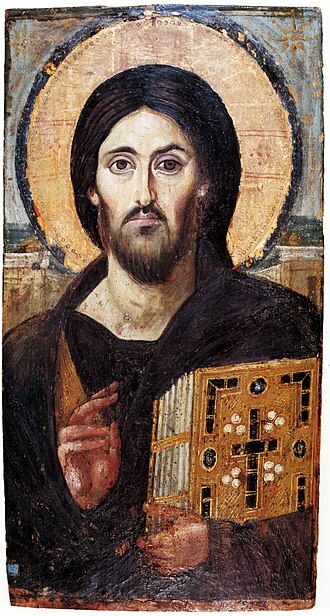 In 943 Kourkouas invaded northern Mesopotamia and besieged the important city of Edessa in 944, as the price for his withdrawal, Kourkouas obtained one of Byzantiums most prized relics, the mandylion, the holy towel allegedly sent by Jesus Christ to King Abgar V of Edessa. 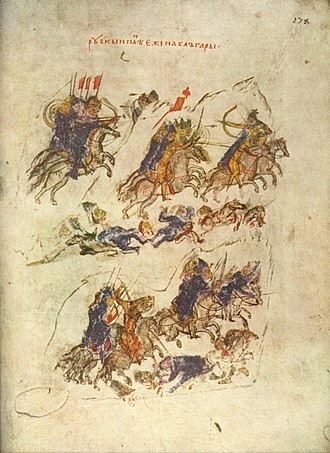 Sviatoslav enters Bulgaria with Pecheneg allies, from the Constantine Manasses Chronicle. The Pechenegs slaughter the "skyths" of Sviatoslav I of Kiev. Gold solidus of Emperor Constantine VII (r. 913–959) with Romanos Lekapenos. After overcoming the rebellion of Leo Phokas, Lekapenos promoted himself to Caesar and was eventually crowned as senior emperor (basileus autokrator) in December 920, ruling until his abdication in December 944. The capture and blinding of Leo Phokas. Consecration of Euthymius as Patriarch of Constantinople. Miniature from the Madrid Skylitzes. Emperor Alexander dismisses Euthymius. Miniature from the Madrid Skylitzes. Depiction of Helena on her deathbed.